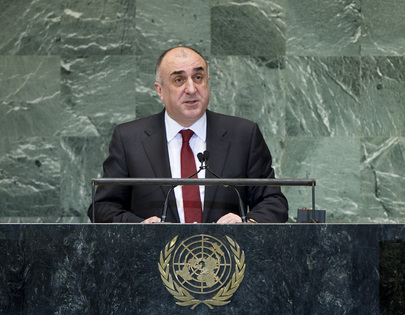 ELMAR MAMMADYAROV, Minister for Foreign Affairs of Azerbaijan, recalled that during the last two sessions of the General Assembly, his country had co-sponsored two resolutions on strengthening the role of mediation in the peaceful settlement of disputes, conflict prevention and resolution. Additionally, during the Azerbaijani Presidency of the Security Council in May, it had organized an Arria Formula meeting to encourage a frank exchange of views, within a flexible procedural framework, on the role of mediation, judicial settlement and justice in promoting durable and international law-based peace and reconciliation. He said that, while the world continued to face persistent, grave and systematic violations of fundamental norms and principles of international law, there were still instances in which “archaic” patterns of the use of force against the territorial integrity and political independence of States were practised to achieve territorial gains, he said. Hundreds of thousands of people around the world continued to suffer from aggression, military occupation, ethnic cleansing and a prevailing culture of impunity for the most serious crimes of concern to the international community. The conflict between Armenia and Azerbaijan, for example, continued to represent a serious threat and challenge to international, as well as regional, peace and security, he continued. It had resulted in the occupation of almost 20 per cent of Azerbaijan’s territory and had made internally displaced persons or refugees of more than a million of its citizens. The aggression had severely damaged the country’s socio-economic sphere. “We sincerely believe that there is no alternative to peace, stability and mutually beneficial regional cooperation”, he said, adding that Azerbaijan had remained committed to the conflict-settlement process, confident that its objective was to end the illegal Armenian occupation, restore its territorial integrity, ensure the return of forcibly displaced people to their homes, and guarantee the peaceful coexistence of Armenian and Azerbaijani communities in the Nagorno Karabakh region within Azerbaijan. He said Armenian attempts to misinterpret the norms and principles of international law, and its insistence on unrealistic annexationist claims — which Azerbaijan would never accept — spoke to the real intentions of the Armenian leadership. That country continued to use force to sustain the occupation of Nagorno Karabakh and seven other districts of Azerbaijan. Additionally, regular ceasefire violations and deliberate attacks by the Armenian Armed Forces against inhabitants of towns and villages situated along the front line and in the border region had become more frequent and violent, resulting in the death and injury of many Azerbaijani civilians. It was vital to continue efforts for inter-communal peace and coexistence for the sake of both communities, he continued. On a number of occasions, Azerbaijan had accepted proposals by different European non-governmental organizations to hold inter-communal meetings, but the proposals had so far been blocked by officials in Yerevan, he said. Moreover, the Armenian leadership’s aggressive rhetoric and undisguised promotion of the “odious ideas of racial superiority”, ethnic and religious incompatibility and hatred towards Azerbaijan and other neighbouring nations could only contribute to deepening the mistrust and making the prospect of a speedy negotiated settlement elusive. The representative of Azerbaijan, responding to the statement by Armenia’s Foreign Minister, said his comment about his country was yet another example of falsehood and created a wrong impression. The Minister was “forgetful” about his country’s aggression against Azerbaijan, he said, adding that it was Armenia that had resorted to the use of force. He also rebutted Armenia’s statement about Safarov, who Armenia said had slaughtered a sleeping Armenian officer with an axe during a NATO programme. That falsehood was characteristic of Armenia’s high-ranking officials, he said. The Security Council and the General Assembly had called numerous times for Armenia’s complete withdrawal from Azerbaijan, he said. It was well known that Armenia had the largest military in the region, with the largest military expenditure. The most shocking thing was that the current President of Armenia had absolutely no regret about ethnic cleansing, he added. The representative of Azerbaijan said Armenia’s blatant distortions demonstrated that Armenia was far from engaging in negotiations to ensure peace and stability in the region. Its “irrelevant and out-of-context” comments had failed to actually answer the concerns raised by Azerbaijan. Armenia’s “distractive political agenda” would never be realized, he said.